The credit for tonight's Filipino Kinilaw (pronounced ki-ni-la-o) goes entirely to my friend Sylvie, who I met through this blog and who so generously gave me this amazing recipe. Except for substituting sea bass for mackerel (because it wasn't available), and not peeling the tomatoes and peppers, because I was lazy, I followed the recipe exactly as written. Words cannot describe how divine this dish is. Perhaps one of the coolest things about writing this blog, is that wonderful people I've never met agree to help me along the way. Sylvie and her husband who are French, are expats who lived in the Philippines for 6 years, followed by 2 years in Colombo, Sri Lanka. Currently, they live in Latvia, where they are raising 2 young children. In my wildest dreams, Sylvie and I will get to meet some day and share a lovely meal. Until then, technology makes our awesome cross-continent friendship possible. 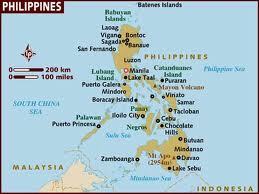 Located in South East Asia, the Philippines lie in the Western Pacific Ocean. The country is an Archipelago of 7,107 islands with 3 distinct geographic divisions. To the country's north across the Luzon Straight is Taiwan. To the west across the South China Sea is Vietnam. The Sulu Sea to the southwest lies between the island country of Borneo, and the the south, the Celebes Sea separates it from Indonesia. Because the country has a tropical climate and is located on the Pacific Ring of Fire, it is prone to earth quakes and typhoons. Concurrently, the climate provides the Philippines with one of the richest biodiversity resources in the world. An ethnically diverse country, Filipino cuisne is a mixture of Malay, Chinese and Spanish traditions. As I mentioned, the country has three distinct regions whose cuisine varies quite a bit. The following information comes courtesy of Sylvie in it's entirety - She did all the work on this one, and I can't thank her enough. Northern Luzon: Arid lands and mountains/Ifugao rice terraces, hence basic but nourishing cuisine (baradibud, a fresh vegetable stew in sweet potato broth, or pinakbet, a vegetable stew with crisp pork belly. Southern Luzon: Fertile are thanks to the taal volcano, Batangas region is know for its beef industry. Its economy depends to a great extent on the coconut tree. Kesong Puti, a popular white cheese made from carabao's milk (water buffalo), far cousin from mozzarella, is produced there. Palawan region: Characteristic is the use of green mango, adding sour taste to otherwise generally sweet cuisine. Central Visayas: Great variety of seafood, often prepared marinated in vinegar, broiled or boiled. Chinese influence is strong in Cebu, but also Spanish, especially in desserts. Davao: Specialty is broiled tuna jaws. This region produces most exotic fruits, including the special Durian. Zamboanga: Very strong Spanish influence (callos, tripes), is also famous for its crabs. Cut the fish into small cubes, marinate in calamansi/lime juice for 1 hour. After 1 hour, add all the remaining ingredients. Chill before serving. Serves 4, usually as a starter. Final Assessment: One of our all time favorite meals so far. The combination of lime, ginger, onions and all the accompanying peppers is sweet, sour and crunchy, while the mild fish "cooked" in the lime juice is tender and succulent. Luckily, we have leftovers which will be tomorrow's lunch! Sarah, your pics are really great. Glad you enjoyed this Kinilaw. Take care. Warmest thanks Sarah for picking this recipe, & glad you enjoyed it. Thanks too for the credits ! Hope to share this meal and drink asap !!! Take care. The thanks is ALL mine, Sylvie! Have a wonderful vacation with your family! Ceviche is truly a food of the gods! We've even made it with bass and crappie. I'm going to try it with ginger next time I make it, that'll be new. Delicious as always, Sadie! Thank, you Traci! The ginger and coconut milk give it such a lovely Asian twist, without overpowering the fish. Glad you're going to try it! Tomato pic !! super ! !